As the title suggests, this multi-part series of posts will take a step off the field and into the front office. The goal of the series is to examine some of the intricacies of the sports industry. Where do teams make their money? How do they spend it? What are the effects of salary caps/floors? How do business opportunities differ among leagues, and within the leagues, how do opportunities vary depending on market size? In the subsequent analyses, I’ll be using financials provided by Forbes. Although the value, revenue, and income numbers aren’t exact, they should be pretty good benchmarks (the Green Bay Packers are the only major North American team to release financial statements because they are the only team that is publicly owned). For this post, I’ll focus on team valuation. 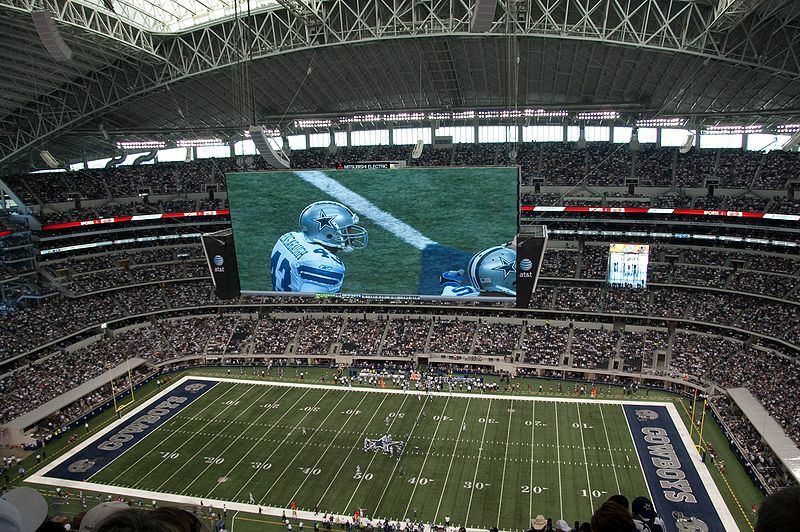 How does Forbes calculate franchise values for the NFL , MLB , NBA, and NHL? To put it simply, value seems to be a function of team revenue. For Major League Baseball, prior to the 2009 season, the following scatter plot shows the relationship of team revenue to team value. The connection is pretty much linear and the two variables have an R2 of .96. 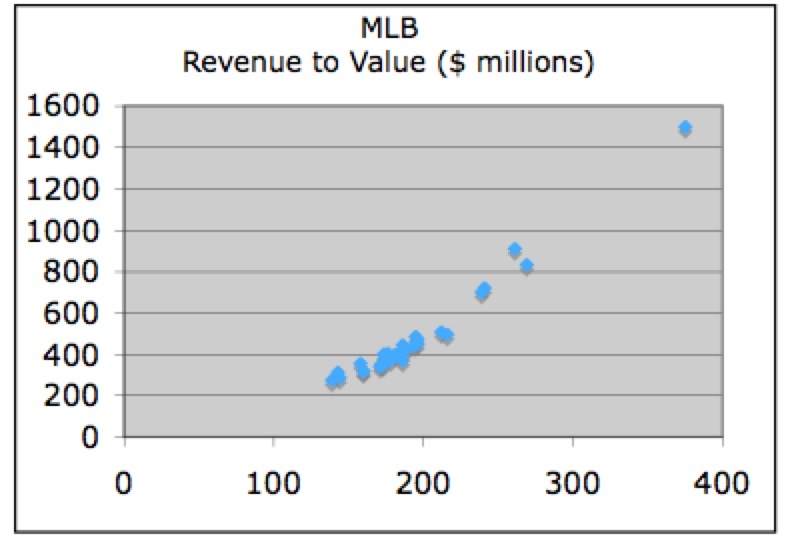 The relationship between revenue and value in the other major leagues is similar. The R2 statistics in the NBA, NHL, and NFL are .98, .96, and .77, respectively. The average value/revenue ratios (also called revenue multiples) for 2009 appear in the chart below. I think it’s a common misconception that team value strictly correlates with how much a team wins. What’s more important is the team’s revenue. Sure, winning definitely plays a part in developing the top line and thus franchise value, but a winning team is not the end-all-be-all in having business success. What winning does is bring fan interest and brand value to a franchise, which helps add to merchandising, ticket sales, local media deals, and sponsorships. But if a team can secure brand value and fan loyalty through other means (state-of-the-art stadium, marketing, team history, etc.) winning doesn’t bring as high of a premium. Using the 2009 Forbes values, one can see winning and value do have some sort of relationship. MLB teams with a World Series Championship in the past 20 years have an average value of $519.77 million. Teams without a title are valued at an average of $452.94 million. But the relationship for all sports is pretty loose on an individual team basis. For example, the Washington Redskins have made the NFL playoffs twice in the last decade but the franchise still has been consistently ranked in the top 2 in overall value. The Toronto Maple Leafs, the NHL’s most highly valued team, have not made the playoffs in 5 years. The New York Knicks have the second highest value in the NBA and they haven’t won a title since 1973. On the other end, the Tampa Bay Rays won 97 games in 2008 but their 2009 value was still ranked in the bottom 5. In the NFL, the Minnesota Vikings and Atlanta Falcons made the playoffs in 2008, but were 2 of the 3 lowest valued teams in 2009. 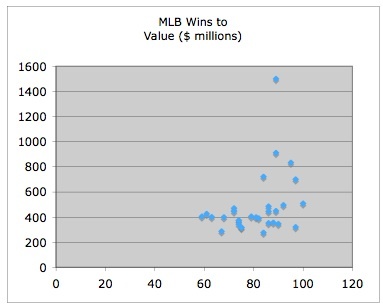 Below is a scatter plot of total wins in 2008 to MLB team value in 2009. The graph shows the relationship between wins and value is nothing like the revenue-value relationship. The R2 in the above plot is .13 and the positive relationship is statistically significant at the 90 percent level, but not at 95 percent. For the NBA, NHL (points instead of wins), and NFL, the R2 for the same plots are .25, .05, and .08. Keep in mind that these numbers are being used to show roughly that the relationship between winning and value is not extremely strong. There is definitely a bit of reverse causality involved, however, because value can be leveraged to “buy” wins through payroll spending. For the next post, I’ll make an attempt at breaking down the Green Bay Packers income statement. From there, I’ll talk about what franchise revenues and costs are in the NFL and then compare them to the MLB, NBA, and NHL.